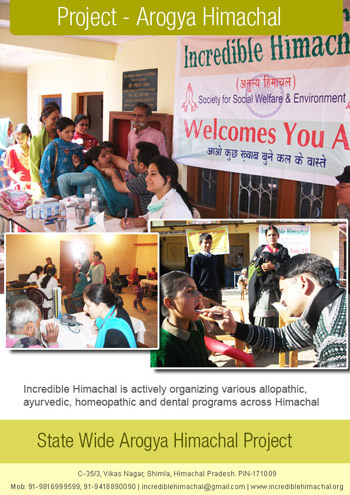 Arogya himachal is a project initiated by incredible himachal to make himachal disease free and healthy state. We aim at making himachal a happy and health conscious state. People here are hard working and life in many areas is very hard, people have to walk over large distances in interior areas for basic needs also. People generally use natural products locally available for the treatment of common diseases. Some people are very poor to afford basic health services. We here aim at providing the basic health amenities at the doorsteps of the people in the villages by organizing various health camps etc. International Shivratri Fair, 2011 at Mandi, Himachal Pradesh. These health camps are organized with the help of government hospitals, so that the trained doctors do the health checkups etc. People are provided free advice and free medicines. People requiring special medical care are sent to the hospitals in the ambulance to the respective hospital. We also provide monetary help for health purposes to the needy.